Died 1820. He was the son of Lieutenant William Osborn, who had served with Captain Hon. Samuel Barrington aboard the Achilles 60 during the Seven Years War, and he was the brother of Admiral Samuel Osborn and of Vice-Admiral John Osborn. Osborn was commissioned lieutenant on 6 November 1778, and having sailed for India with the Cornwallis Expedition in February 1789 he exchanged at Tenerife with Lord Henry Paulet from the Phoenix 36, Captain George Anson Byron, into the Crown 64, Captain James Cornwallis, carrying the broad pennant of Commodore Hon. William Cornwallis. He was promoted commander on 22 November 1790 and posted captain on 1 October 1791. Taking command of the Vestal 28, he arrived at Spithead on 30 June 1792 with despatches from the commander-in-chief, Lord Cornwallis, after a voyage from Madras lasting four months and ten days. Two months earlier the newspapers had reported his arrival with news of the capture of Seringapatam, but this had proved to be a fabrication with fraudulent implications for the East India Company on the Stock Exchange. After a period of unemployment Osborn joined the Colossus 74 at Spithead at the beginning of September 1795, but he left her at the end of the month on his appointment to the Trident 64, being attached to Rear-Admiral Hugh Cloberry Christian’s ill-fated West India bound force which set sail on 16 November. Most of the fleet, including the Trident, were forced by ill weather to return to Portsmouth, and after trying to depart for a second time the Trident was amongst those vessels that returned home at the end of January. She was then attached to Rear-Admiral Henry Harvey’s squadron in March that was sent to search for a Dutch squadron off Cape Clear, following which she escorted a convoy from Plymouth to Portsmouth during April. At the beginning of May 1796 the Trident departed Spithead with an East India Convoy, and she was present at Admiral Sir George Keith Elphinstone’s capture of the Dutch squadron in Saldanha Bay on 17 August 1796. In the middle of November she sailed from the Cape with an outward bound fleet of half a dozen Indiamen, arriving at Madras in early January 1797. Osborn remained in the East Indies under the orders of Rear-Admiral Peter Rainier, and at the end of the year sailed for China with another convoy in company with the Sybille 28, Captain Edward Cooke, and Fox 32, Captain Pulteney Malcolm, before eventually departing those waters at the end of March 1798 with the homeward-bound Macao convoy. From the summer of 1798 Osborn took command of the thirty year-old Arrogant 74 on the East Indies station. On 27 January 1799, being at Macao in company with the Intrepid 64, Captain William Hargood, and Virginie 38, Captain George Astle, a Franco/Spanish squadron of two 74’s and four frigates appeared off the port but declined an engagement, and a gale thereafter prevented a meeting of the two forces. In the early summer of 1800, having sailed on a cruise in the Dutch East Indies in company with the Orpheus 32, Captain William Hills, the two vessels drove a 28-gun Dutch armed ship and 14-gun brig ashore on 16 May near Point Indramayu on the northern coast of Java, forcing their surrender the next morning. After further captures the Arrogant took the French privateer Uni 24 and her prize, an English merchantman, on 4 August before entering Madras a week later. Returning to Java, Osborn’s boats cut out a Dutch merchantman from the port of Jepara on 1 December. 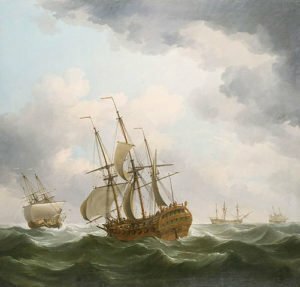 The Arrogant next took a small convoy of East Indiaman out to China, arriving in the spring of 1802, but she was reportedly dismasted in a typhoon in the China Sea, and after effecting repairs locally she reached Bombay at the end of October. She was paid off in November 1803 prior to being hulked at Bombay in 1804, but it is not clear at which point Osborn left her. Back in European waters he had the London 98 for a short time during June 1806, briefly flying the flag of Rear-Admiral John Child Purvis before that officer sailed for a posting in the Mediterranean, and he then moved into the Hibernia 110, Captain Tristram Robert Ricketts, as captain of the Channel fleet to Admiral the Earl of St. Vincent. In 1807 he had the Kent 74 for a short while in the Mediterranean, receiving on board a midshipman and four boys who had been recovered by Vice-Admiral Seniavine’s Russian fleet from Turkish captivity. Osborn did not see any further service, but he was promoted rear-admiral on 31 July 1810, and vice-admiral on 4 June 1814. He died at Horndean, Hampshire, on 3 July 1820. He married Elizabeth Hawker, the daughter of Captain James Hawker, and had two sons, John and Edward. He was the brother-in-law of Admiral Edward Hawker, Vice-Admiral Charles Boyles, and Rear-Admiral Sir Michael Seymour. The address in his will was given as Plymouth, Devon.